It's fiesta time! This is Yolie kicking off the hop with a fun filled crafts celebrating Mexican Culture Day. So let's get started! The guitar is a file from SVG Cuts. I cut all the components and used the eBrush with Sharpies for shading. I used various pattern paper from Sabor Papel. I found that DCWV Brights Card Stock Stack coordinates perfectly with Sabor's paper. The guitar is very easy to assemble. 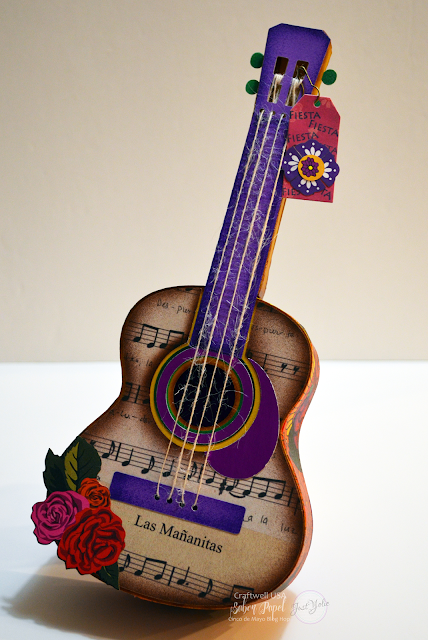 I used jute for the strings, cut a tag and stamped "fiesta" by Latina Crafter and attached it to the neck of the guitar with a garment pin. It's just as pretty in the inside! Your next stop is SABOR PAPEL's blog. We will have six winners! In order to enter the giveaway, you must leave a comment on all participating blogs. Please like the Sabor Papel and Craftwell's facebook pages but you are not required to. You can comment once on each blog thru the 8th of May . Winners will be chosen at random from the comments left on all of the blogs We will check to make sure all of the rules are followed. The comments will close at 11:59 PM PST on Sunday May 8, 2016. We hope you enjoy the hop! This great! So colorful, is a beautiful project. Thanks. This guitar "rocks"! I love it. Can't wait to try my hand! WOW!! 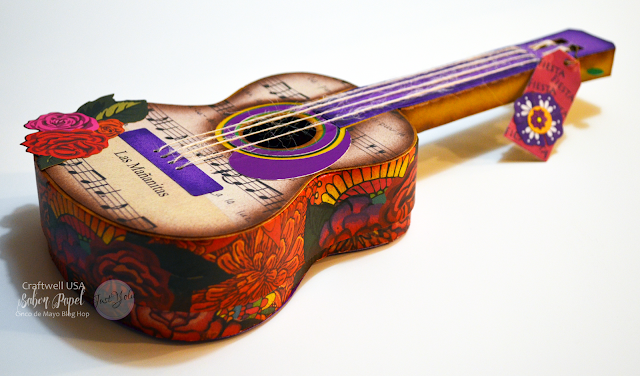 That is amazing guitar! Fun fun fun colors! That is so beautiful. Lovely project. OMG IS THIS STINKIN CUTE! I want to do this Yolie, Outstanding work! How stunningly beautiful! And to the next blog! the guitar is to die for!!! I love making demensional items!!! What a fun way to celebrate Cinco de Mayo. Love the guitar. Yolie your project is amazing. Those papers are gorgeous. The guitar looks festively wonderful! Oh my gosh this is awesome!!! Wow! What an amazing project, I love everything about it! The papers are gorgeous and I love the ebrushed details. The ebrush is definitely on my wish list! 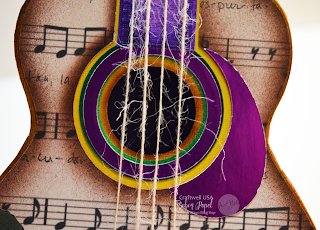 The jute strings are such a fun accent and I totally love how it opens up to hold a fun gift! Fabulous project Yolie! This is like the cutest think EVER! Love love this for all the musicians in the family. Thanks for sharing. Yolie! Love it! 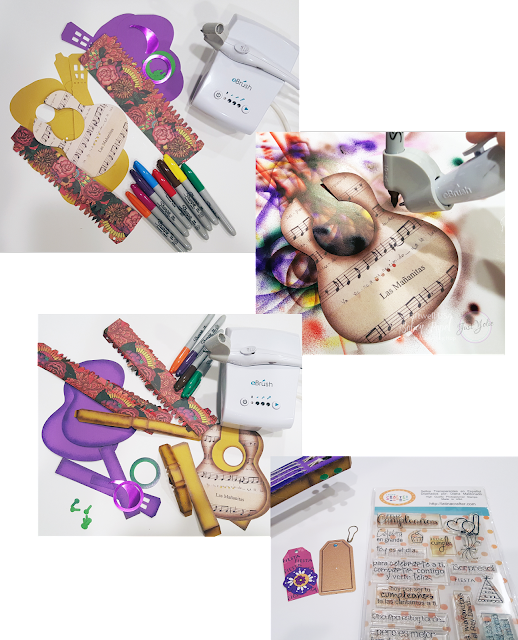 What a great project and kick off for the blog hop. 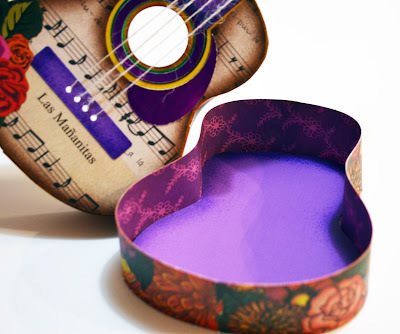 Such a cute little guitar keep sake box. Love this paper line. Epic and beautiful. I am so making this for my daughters new bedroom makeover. She plays a uke and this will be perfect... Thanks so much for the inspiration. Its awesome. Wow, this is really stunning. WOOZER!!!! Yolie, you out did yourself on that guitar...it is amazing!!! WOW!! I am speechless! This is truly STUNNING! Beautiful job, Yolie! Yolie, my friend, you rock! Amazing project! This is fabulous to start off the holiday with the romantic feel!! Love your work Yolie! Que caja tan linda! super creativa! What a lovely box! Super creative! Holy Moley! I haven't seen anything created like this before. This guitar is utterly amazing and beautifully done! Very creative project! Fabulous details!